Both the anti and pro-Brexiteers are doing a splendid job of confirming Jiddu Krishnamurti's thesis that leaders destroy the following and followers destroy the leaders. Just one example comes from the Creative Industries Federation - one of several music-related anti-Brexit pressure groups - which has published seven principles for Brexit. These include the objective that the UK should continue to influence the shape of the EU's Digital Single Market, but completely fail to mention safeguarding the future of physical product and non-digital distribution. As is proven by numerous examples such as the one above, the move towards a single digital market is a major factor in the destruction of the recorded music market. 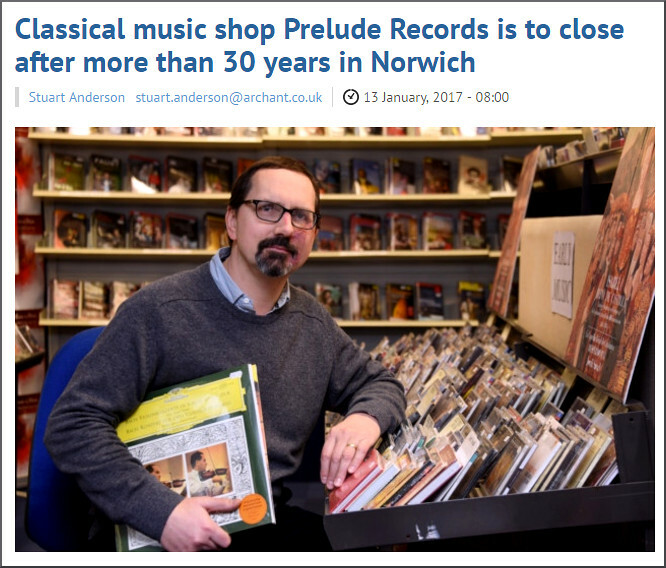 One of the consequences of this has been the forced closure of virtually every independent bricks and mortar record retailer. Despite mouthing platitudes about 'maintaining a robust and properly enforced intellectual property (IP) regime' the music sector of the creative industries has willingly handed control of recorded music distribution - the channel through which IP moves - to mega-corporations such as Apple and Amazon whose only passion is for the bottom line. The destruction of the physical supply chain has resulted not only in the closure of priceless high street retailers, but also the demise of the unsung distributors (wholesalers) whose knowledgeable and passionate sales representatives played a crucial role in getting small labels and niche repertoire physical display space in front of customers. Yes, those small labels can still be listed at penurious financial cost on Apple Music, Spotify and Amazon; but they are just a few files in a gargantuan online data warehouse with no visibility and hence little chance of achieving sales and income; which leaves the vitally important long tail of music dead in the water. And the move to a single digital market is not an inevitable consequence of technological progress: because it ignores the continuing and increasing consumer demand for tangible product as demonstrated by the renaissance in vinyl sales and underlined by the faltering demand for eBooks. And in their enthusiasm for the digital nirvana the Creative Industries Federation conveniently overlook that those pesky CDs and LPs provide employment for creatives who produce album artwork and sleeve notes. As of today whoever so wishes can download any or even all of my music completely free of charge (the only recording which remains for sale is my most recent one...) I have decided to do this because I would like all of the rest of my music to be easily available to anyone who wishes to listen without any financial dimension whatsoever. After so many years, I’m really really fed up with the financial side of the recording industry but I still love sharing my recordings with other people. This is the only thing that I could do in order to be able to continue enjoying that and that is more important to me than any amount of money.